King John was forced to sign Maga Carta in 1215. Richard 1 The Lionhearted spent only several months in England as its king. 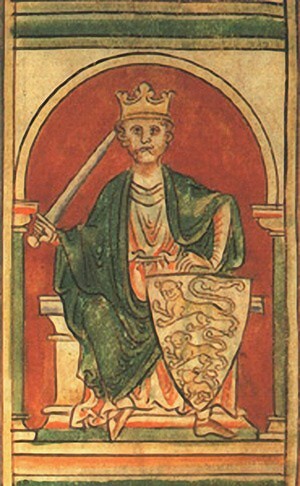 In an alliance with King John the Pope Inncent III annuled Magna Carta. The special exhibition of rare documents is on view at the Clark until November 1. One of only four surviving copies of Magna Carta. Clark director Michael Conforti with opening remarks for the special exhibition. Conforti discussing Magna Carta with the document’s courier. 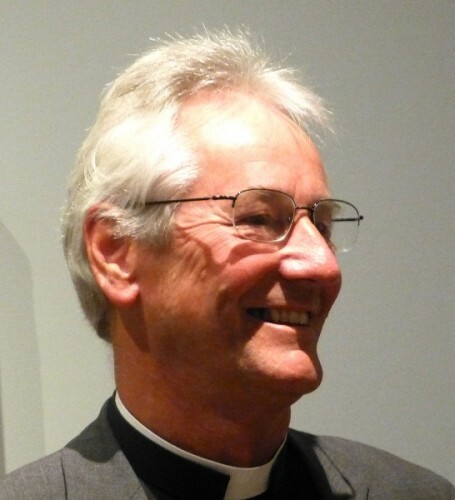 The Reverend Philip Buckler the Dean of Lincoln, England which owns the rare document. 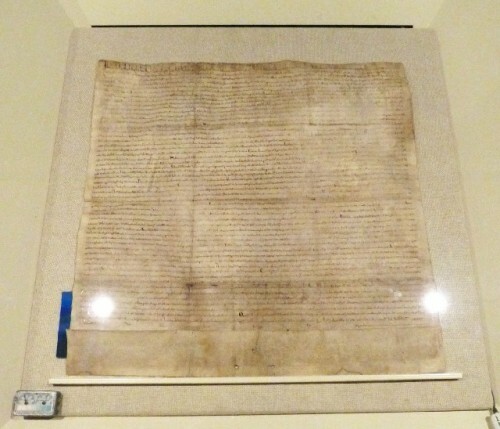 There are four surviving parchment copies of Magna Carta which King John was forced to sign by England’s Barons on June 15, 1215, near Runnymede, England. Through complex negotiations with Pope Innocent III a few months later it was annulled. Scribes had created some 40 copies of the document that limited the Divine Right of Kings and provided the basis of a constitution and the foundation, modified over the century in several versions including a 1297 document, into English Common Law. 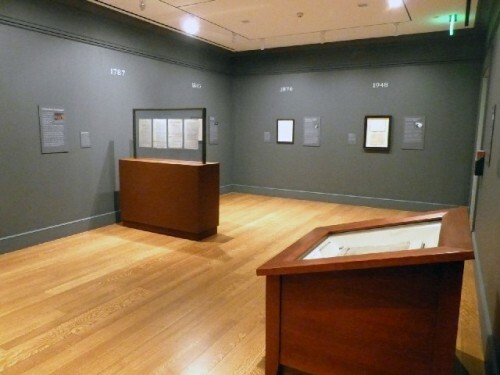 One of four extant copies of Magna Carta is included in the exhibition Radical Words: From Magna Carta to the Constitution which remains on view at the Clark Art Institute through November 2. 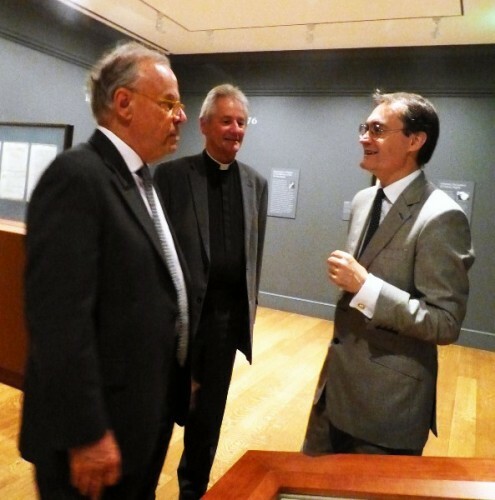 Prior to the Clark the priceless document was displayed in a different context at the Museum of Fine Arts Boston. There it was seen with works related to the American Revolution which adapted its radical rhetoric in the Declaration of Independence. In a small room among the works displayed was John Singleton Copley’s portrait of the most ardent of Boston’s Sons of Liberty, Sam Adams. The painting created before Copley sailed to England prior to the outbreak of war shows the plain clothed, saloon keeper pointing to documents and petitions sent to King George III. The Clark installation is all text and in a small fine hand indeed. Plan to absorb the gestalt of the occasion rather than read the documents. For convenience we have printed a translation of Magna Carta from the Latin at the bottom of this report. If you are unfamiliar with the document you may be surprised by how it discusses the rights of widows and payments of usury to Jews. Bankers had not yet managed to evoke the New Testament passage of the Tribute Money (Render unto Caesar) which exonerated them from the sin of lending money for profit. This was finessed by the Medici and other financiers in Florence during the Renaissance. Fleshing out the Clark’s special exhibition are rare documents from the Chapin Library of Williams College. These include the Declaration of Independence in 1776, the U.S. Constitution in 1787, the Emancipation Proclamation in 1863, the Declaration of the Rights of Women of the United States in 1876, and the United Nations’ Universal Declaration of Human Rights in 1949. 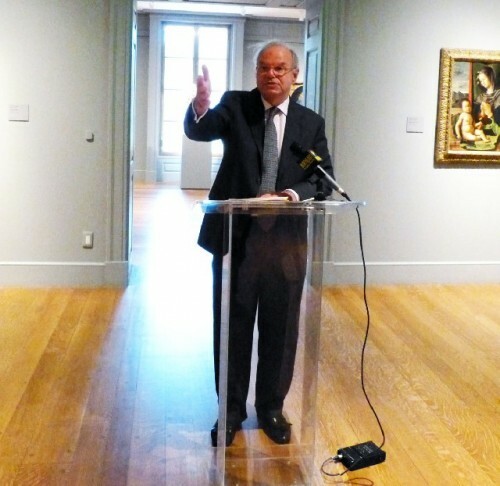 In remarks during the opening of the exhibition yesterday Michael Conforti, director of the Clark said it is "Probably the greatest archival object we could ever imagine having." Because Magna Carta was quickly annulled most copies were destroyed or disappeared. As Philip Buckler, Dean of Lincoln, the town in England that houses the Lincoln Cathedral and the Lincoln Castle, where Magna Carta resides, explained “We don’t throw things out. If you want a document to survive throw it in a drawer and forget about it for 600 years...the key thing that Magna Carta says is nobody, not even the king, is above the rule of law. That is the key thing of Magna Carta that has stayed down the centuries — the rule of law is there and nobody is above it...When you look back at Magna Carta you see the remarkable beautiful script, the taut writing of the early 13th century in itself a work of art. Of course, it also contains the beauty of belief and the beauty of ideas ... ideas and beliefs that have influenced the world, the Western world, over these past 800 years." It was discovered during a national survey of British documents. The rare document has traveled to the U. S. several times including a visit in 1939. Because of the outbreak of war it was stored for the duration at Fort Knox causing Reverend Buckler to comment that is worth more than a number of the gold bars stored there. Moving the rare document represents complex security and conservation protocols. A curator/ courier accompanies the document from venue to venue. The parchment, which seemed to do just fine in a desk drawer for several centuries, is now housed in its own alarmed and climate controlled vitrine. It is displayed under conditions of minimal light to avoid fading. After its run, or is it Runnymede, the document travels to Washington, D.C. before returning home for its 800th Birthday celebrations. If you are a fan of Robin Hood you know that King John (24 December 1166 – 19 October 1216), who ruled from 6 April 1199 until his death in 1216, was a tyrant bleeding the Barons for taxes. He ruled during the absence of his brother Richard 1 The Lion Hearted (8 September 1157 – 6 April 1199) who was more of a warrior than monarch. 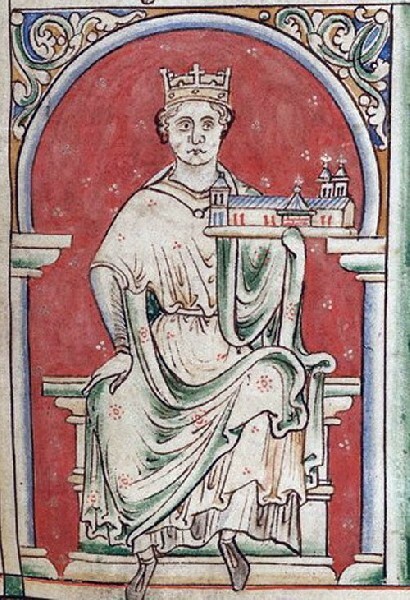 Richard, who grew up in England, spent only several months there as King. When not fighting or leading the Third Crusade he preferred to reside in Aquitaine and various French castles. Despite John’s reluctance to raise ransom money once free Richard forgave his brother and named him as heir. A key element of the revolt of the Barons resulted from excess taxes of the crown laid in place by the Domesday Book. Twenty years after the Norman Conquest of 1066 William the Conqueror ordered a census of his realm. There had been considerable chaos when Norman lords confiscated Anglo Saxon estates. The king wanted to know precisely who owned what in order properly and efficiently to levy taxes. It has proved essential to our understanding of medieval British topography, demographics and genealogy. There is a direct line from the Domesday Book of 1086 and Magna Carta of 1215. That did not extend to women, slaves and non holders of property. Similarly Magna Carta was about establishing the rights of the Barons. It did not extend to their serfs or chattel. But it was a beginning that led to Locke, Hobbes, Rousseau’s The Social Contract, Paine’s the Rights of Man, and eventually the Bill of Rights. Surely this will be discussed by school groups in the Berkshires taking advantage of a remarkable opportunity. (1) FIRST, THAT WE HAVE GRANTED TO GOD, and by this present charter have confirmed for us and our heirs in perpetuity, that the English Church shall be free, and shall have its rights undiminished, and its liberties unimpaired. 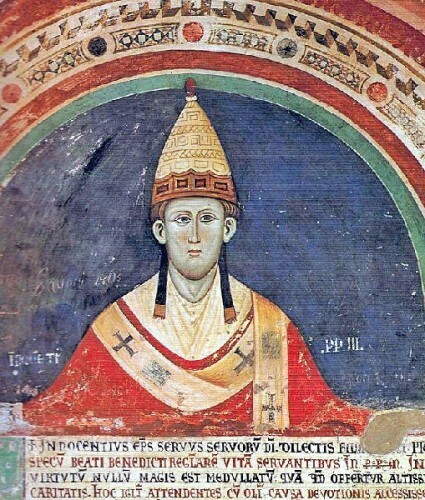 That we wish this so to be observed, appears from the fact that of our own free will, before the outbreak of the present dispute between us and our barons, we granted and confirmed by charter the freedom of the Church’s elections — a right reckoned to be of the greatest necessity and importance to it — and caused this to be confirmed by Pope Innocent III. This freedom we shall observe ourselves, and desire to be observed in good faith by our heirs in perpetuity. * (12) No ‘scutage’ or ‘aid’ may be levied in our kingdom without its general consent, unless it is for the ransom of our person, to make our eldest son a knight, and (once) to marry our eldest daughter. For these purposes only a reasonable ‘aid’ may be levied. ‘Aids’ from the city of London are to be treated similarly. * (14) To obtain the general consent of the realm for the assessment of an ‘aid’ — except in the three cases specified above — or a ‘scutage’, we will cause the archbishops, bishops, abbots, earls, and greater barons to be summoned individually by letter. To those who hold lands directly of us we will cause a general summons to be issued, through the sheriffs and other officials, to come together on a fixed day (of which at least forty days notice shall be given) and at a fixed place. In all letters of summons, the cause of the summons will be stated. When a summons has been issued, the business appointed for the day shall go forward in accordance with the resolution of those present, even if not all those who were summoned have appeared. * (15) In future we will allow no one to levy an ‘aid’ from his free men, except to ransom his person, to make his eldest son a knight, and (once) to marry his eldest daughter. For these purposes only a reasonable ‘aid’ may be levied. (26) If at the death of a man who holds a lay ‘fee’ of the Crown, a sheriff or royal official produces royal letters patent of summons for a debt due to the Crown, it shall be lawful for them to seize and list movable goods found in the lay ‘fee’ of the dead man to the value of the debt, as assessed by worthy men. Nothing shall be removed until the whole debt is paid, when the residue shall be given over to the executors to carry out the dead man s will. If no debt is due to the Crown, all the movable goods shall be regarded as the property of the dead man, except the reasonable shares of his wife and children. * (50) We will remove completely from their offices the kinsmen of Gerard de Athée, and in future they shall hold no offices in England. The people in question are Engelard de Cigogné’, Peter, Guy, and Andrew de Chanceaux, Guy de Cigogné, Geoffrey de Martigny and his brothers, Philip Marc and his brothers, with Geoffrey his nephew, and all their followers. * (53) We shall have similar respite in rendering justice in connexion with forests that are to be disafforested, or to remain forests, when these were first a-orested by our father Henry or our brother Richard; with the guardianship of lands in another person’s ‘fee’, when we have hitherto had this by virtue of a ‘fee’ held of us for knight’s service by a third party; and with abbeys founded in another person’s ‘fee’, in which the lord of the ‘fee’ claims to own a right. On our return from the Crusade, or if we abandon it, we will at once do full justice to complaints about these matters.